From Ulaanbaatar we drove for about 3 hours into the countryside to stay with local Mongolian families who still live a nomadic lifestyle in Ger camps. On the way we stopped at the amazing Turtle Rock, which funnily enough looks like a turtle. There is a legend that the wife of an old Khan haunts the rock because she and her husband were hiding there during a battle and they had to leave suddenly without taking their treasures which have never been found. 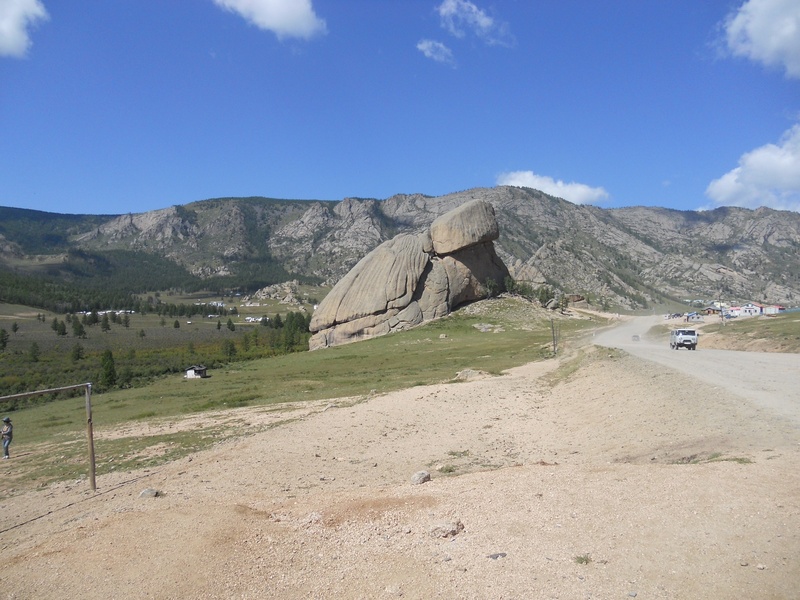 We climbed up to the neck of the turtle, squeezing through a narrow gap for some great views of the steppe. To get to our first host family we hopped onto three ox carts who took us on a bumpy but amazing journey through streams, past mountains and down the valley to a family who would host us. 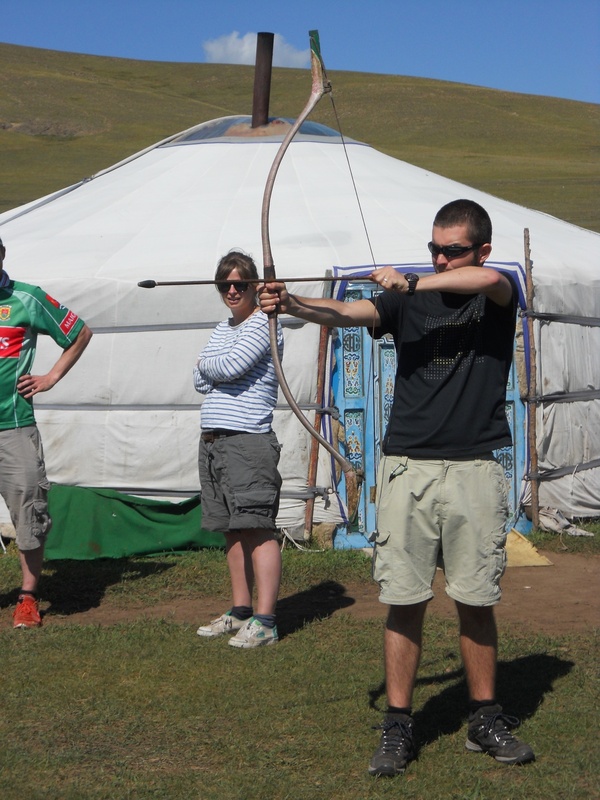 We spent four incredible days living with three different families, staying in their gers, eating with them and learning traditional ‘manly’ pursuits and womanly skills like archery, ankle bones (a kind of dice game made from sheep ankle bones) sewing, knot tying and cow milking. We both excelled in all these areas… Not. 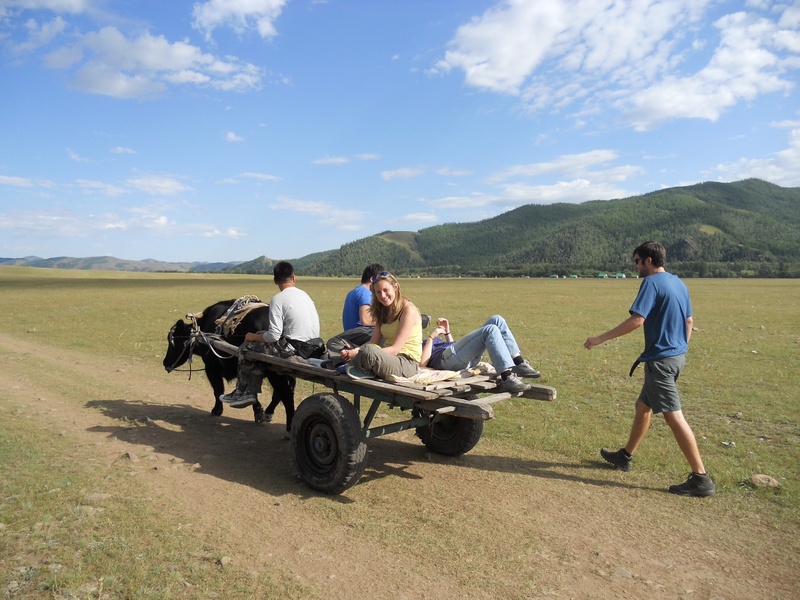 The Mongolian people move their gers, families and all their animals four times a year. Toilets were a hole in the ground and there is no electricity, although a couple of families had a satellite dish and a tv hooked up to a car battery. We ate really simple but delicious soups, stews and dumplings and playing with their kids was a real highlight. Sorry Falmouth guys, but this little girl fell in love with Mr pasty and I just couldn’t take him back! We also got a taste of rural life and were sent to the fields to collect hay for the afternoon with ten people and just two rakes. This was fun for about 20 mins, but we were glad to crack open some beers once we got back! 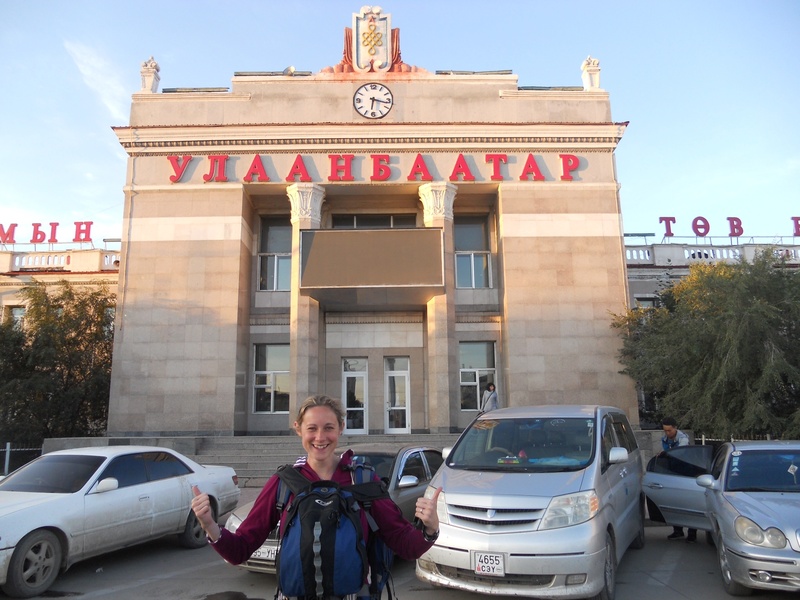 After four days we headed back to Ulaanbaatar really wishing we could see more of Mongolia. It’s amazing to think that this is something like the 18th biggest country in the world, but only has a population of 3 million people. Heading to Beijing next and we had a feeling there might be a few more people there. 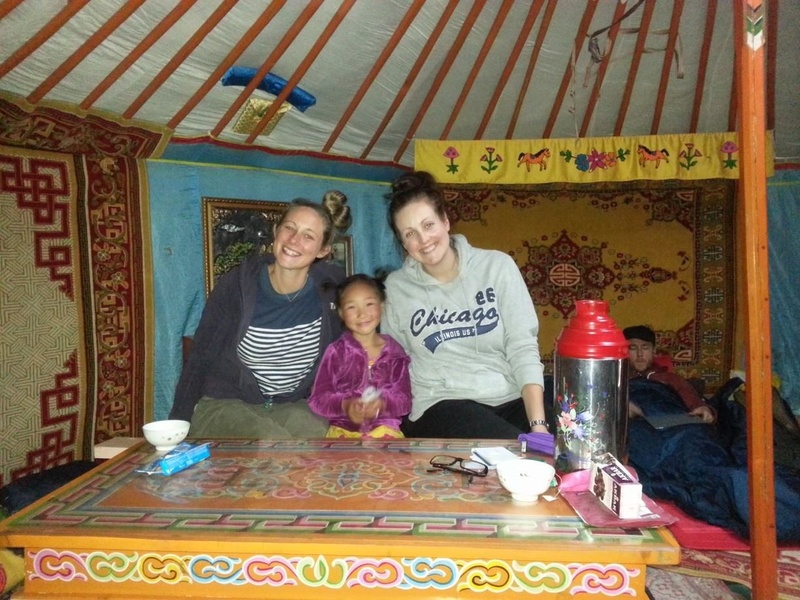 Time to catch up a bit on the blog… We have just reached China following a week in Mongolia, and it was amazing. It is one of the most interesting countries we’ve ever been to. We arrived in Ulaanbaatar at 6am to be met by our Vodkatrain honcho, a guy called Louis. He was with us throughout our time there and was brilliant. Because we couldn’t check in that early, we had a drive around the city, which at that time was practically empty – we climbed a Soviet era viewing platform for a panorama of UB, and visited the city square and parliament building, which features a statue of the main man around here, Chinggis (Genghis) Khan. We also checked out a few Buddhist temples and the National Museum – more awesome Khan fun. After finally checking in and power napping, we went out for the best and most surreal night of the trip so far. An all you can eat Mongolian grill, followed by a keg of beer and bottles of Chinggis vodka in a hybrid German / Mongolian bar called Khan Brau. We saw a Mongolian rock band, and finally decided that karaoke would be a good idea – belting out Toto’s Africa in Ulaanbaatar is now off the bucket list.